This is our house. I love my house. We moved in here three years ago today and I still can't believe how blessed we are to live in such a great home, full of light and character, in such a great community. The spaces we live in definitely affect how we feel. I think you could say that I am a creative, visual person - I like the spaces in my home to be colourful, creative and personal. I guess my kids are picking that up from me, as well. 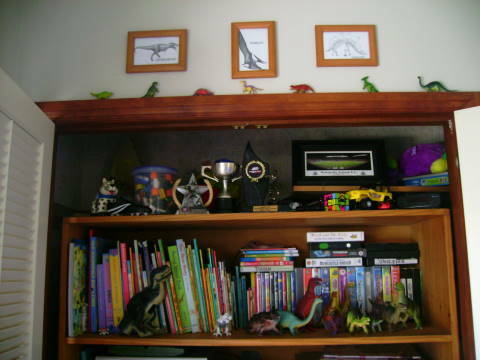 A chance conversation on Saturday presented me with the opportunity to help him feel excited about his bedroom as well as getting involved with what he's learning at school: dinosaurs. He was talking about how much he's enjoying the topic and I said, "Hey you know I think you have an old dinosaur poster somewhere... do you want me to find it and put it on your wall?" Yes please! 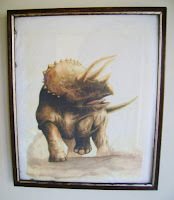 One thing led to another and before long I was digging out all his old toy dinosaurs and dino books, framing a too-small triceratops t-shirt my brother had hand-painted, printing out dinosaur pictures off the internet for him to frame or colour and stick up on his pinboard. 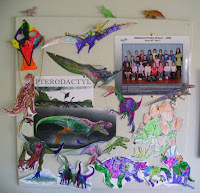 I even put some mini dinos along the pelmet of his cupboard - securing them with a little blob of blutac. We spent the afternoon colouring in (and playing PS2 Dino Den Buzz) together while Scrag was asleep, Princess was out and Daddy was at soccer. 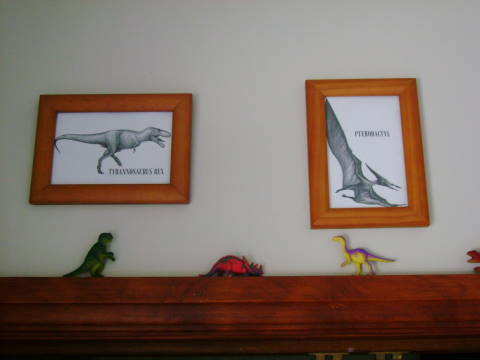 To say he is proud of his Dinosaur bedroom is an understatement. And I have to say, he's been keeping it very tidy! Then there's Miss Fab's room. On Monday during her first day at school, I spent the morning freshening it up and changing it around for her. I wanted to make space for her new beanbag (a birthday present) - I envisaged a little corner where she could relax, sit and look at books, play her CDs, draw. I changed her duvet cover and re-hung the mosquito net Nan gave her (which had fallen down cos the hook I used was too small). I scrubbed and dusted and culled and straightened. Her reaction when she walked in her room was priceless. She froze and stood with her mouth dropped open, then she spun around and shouted... "Wow! I Love it! You're the best mummy ever!" and threw her arms around me. Awwww! Last night I walked past her bedroom and spied her cosied up on her beanbag, her Hi-5 Cd playing, looking at her books. It's a great little relaxing space for her! Now I am looking at my bedroom. I am thinking of painting the marked and faded walls with some paint I have stashed away (SeaFog). I am thinking of investing in a crisp new white cotton duvet set (our current one is a little tired). 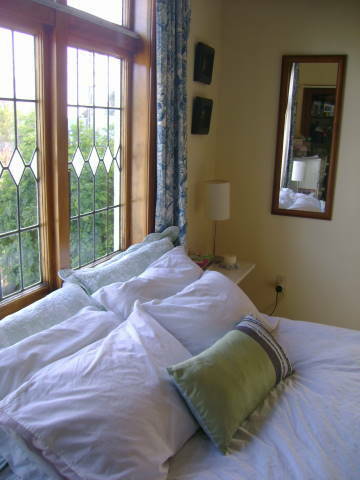 I am thinking of turning my ill-fitting curtain into a roman blind... and I am dreaming of getting Mr G's office out of my sunroom and creating an artspace where I can paint and create on these long quiet afternoons with Princess at school and Scrag asleep. What are your favourite spaces in your home? 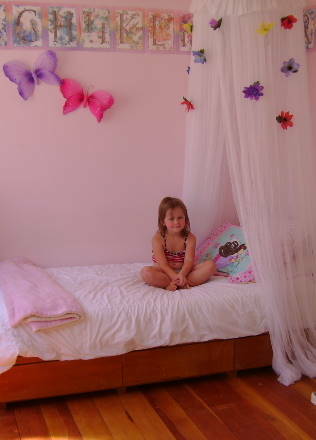 Wow those rooms look wonderful Simoney! !Well done! 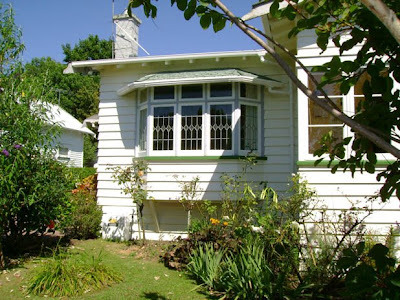 Lovely house... we have nearly finished renovating our room so might also have to do a post. 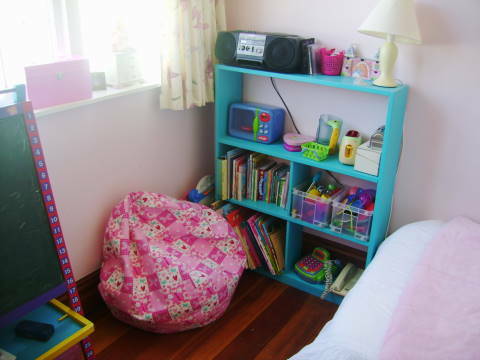 Love what you've done in the kids bedrooms! Gosh this makes me miss living in my own home. Rentals are hard for a creative to live in. Good job though, those rooms look lovely.